With one foot in the art world and one foot in the world of music, Yung Jake’s post-internet work explores the intersections of art and technology, reflecting on the influence and impact of digital culture and social media on modern reality. 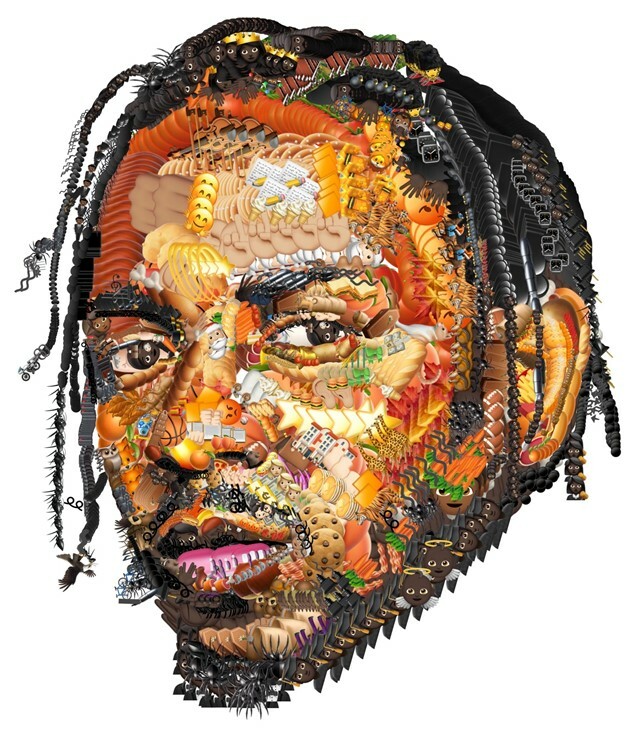 Based in LA, the visual artist and musician – once dubbed the art world’s favourite rapper – is best known for his 2012 interactive music videos. Named for the technology they utilise – “e.m-bed.de/d” “augmented real” “datamosh” – these videos are rooted in different facets of internet life, familiar to anyone who has spent time online. Building on this exploration of contemporary pop and digital culture, in 2015, Yung Jake released his Emoji Portraits in which the likenesses of celebrities, ranging from David Bowie to Kylie Jenner, are rendered in emojis. Which, thanks to the availability of the emoji tool emoji.ink on Yung Jake’s website with coder Vince McKelvie, anyone can recreate for themselves. Famous for only being interviewed over text message, Lil Miquela caught up with Yung Jake, who recently wiped his Instagram account, in an attempt to find out more about the elusive artist constantly reinventing himself. Lil Miquela: Jaaaake! So, big, obvious question first: you wiped your IG of your previous work and said it was time for you to “level up.” How’d you come to that realization? Yung Jake: Hi. It just didn’t feel right. I was trying to please an audience and not myself. Yung Jake: I can appreciate it and sometimes I’m immensely proud of it but I never want what I was to be a blueprint to who I can become. Lil Miquela: You once described your emoji art to the NYT as not being “very deep … or high concept like my other stuff,” but I want to fight about that a bit. Just a lil’ casual low-key brawl. I think it’s deep! What makes you think it’s not? Yung Jake: I came up with the emoji portrait concept but repeating the same concept over and over doesn’t bring new ideas to the world. It was like trying to create new ideas with a mold that only can make one form. Lil Miquela: When am I going to get to hear new music from you? Yung Jake: U can hear it whenever. I am working on a country project. Lil Miquela: Is there a beauty trend out right now that you’re really into? Lil Miquela: I’m always curious about what visual artists do with their own faces as a canvas. How do you take care of your skin? Do you have a routine? A beauty regimen? Ever do the whole, like, chill with a facemask in a tub full of rose petals thing? Lil Miquela: What role do you think hype and online clout play in the art world right now? Do you think it’s the same for beauty and fashion? Yung Jake: It is hard to exist online without serving the gods of clout. But it is a double edged sword. The wealthy elites will always try to evaluate art by measures other than clout but in the end I always see a gravitation towards it. Ppl want what other ppl want. Lil Miquela: Maybe this question is me sort of projecting my own fears, but… did your relationship to your art or your artistic process change when your work became popular and visible? Yung Jake: My dream is to have enough recognition that I can do anything and it will get big amounts of analysis. When more thought by others goes into my work after its genesis than I put in to making it, I’ve succeeded. This has happened. Lil Miquela: What music do you listen to when you work? Yung Jake: I work in silence unless someone is around and puts something on. Lil Miquela: What about “the future” makes you feel most excited or optimistic?